Hizb ut-Tahrir draws urgent attention of the judges, lawyers and human rights activists towards the plight of their Muslim brother Dr. Iftikhar. 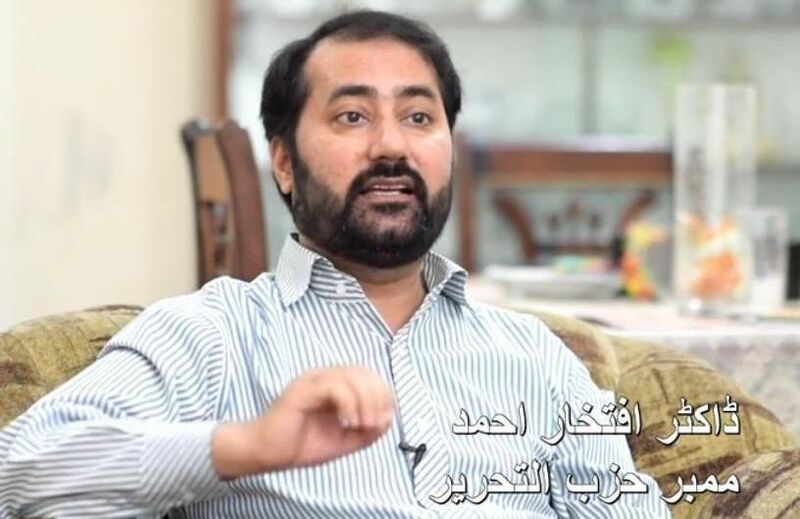 On 26 May 2015, the regime seized Dr. Iftikhar outside Ghurki Hospital in Lahore, where he was seeking treatment for a severe disease of the gut. Dr. Iftikhar is a capable medical doctor who has worked as a registrar in adult medicine at Ghurki Hospital as well as holding a post as lecturer in Lahore Medical and Dental College. He was seized because of his political activities for the restoration of the Khilafah in Pakistan. He is continues to be denied bail (Case Number 18391/2015) and is held at Lahore Central Jail, Kot Lakhpat Jail, along with many other shebaab of Hizb ut-Tahrir. Dr. Iftikhar suffers from ulcerative colitis for which he has been taking strong medication, including daily oral steroids and more recently Cyclosporin A, a powerful immuno-suppressant. He has to undergo regular review by a surgeon because persistent poor health may require surgery to remove some of his gut at any time. He was at first denied a special diet to prevent worsening of his illness and then denied medical review despite repeated appeals. Over three months since his arrest, a medical review finally took place and revealed a pitiful situation due to both his condition and the side effects of the strong medications he is taking. He has recurrent bouts of dizziness and his eyesight has weakened. He suffers from raised blood pressure as a side effect of his medication, whilst concurrently suffering from anemia due to blood loss through his bleeding gut. He has persistent fungal infections and swelling in his feet and experiences numbness in his hands and feet. His bones have thinned to the extent that he has been advised a bone scan and his muscles have atrophied such that he has difficulty standing up. "And those who have wronged are going to know to what [kind of] return they will be returned." "یہ لوگ ان مسلمانوں (کے کسی اور گناہ کا) بدلہ نہیں لے رہے تھے سوائے اس کے کہ وہ اللہ غالب لائق حمد کی ذات پر ایمان لائے تھے"
"جنہوں نے ظلم کیا ہے وہ بھی ابھی جان لیں گے کہ کس کروٹ الٹتے ہیں"